We hate disconnected logons too! One of the most common support queries we receive is to report the below error… this could be a disconnected logon. If this is occurring and you believe that user is not currently accessing that module, there could be a couple of different reasons why. The first thing we would check would be ‘Disconnected Logon‘. This is when a user has for some reason been thrown out of sage or had to ‘crash out’ with a window still open. This window that was still open will be locked for future users and prevents anyone from making any changes on this screen. By clicking on a login and then selecting ‘Log off’ this will remove all related locks. 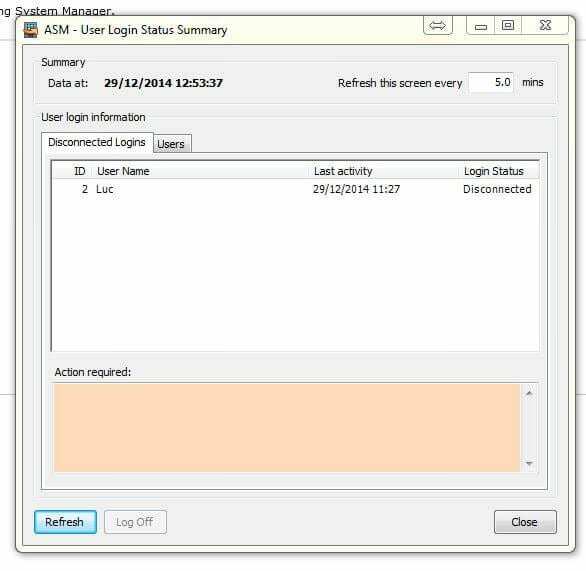 **TIP** If you have multiple Disconnected Logins: Hold the Control Key on your Keyboard and select the multiple Logins, and to log off more than one at a time.